As with all National Reconnaissance Office Launches, the payload is not officially identified by the NRO. Mission specifics such as launch vehicle configuration, launch site, launch time and hints that can be found on the payload mission patch can be used to pin-point the identity of the secret satellite(s). The NROL-67 mission has shown a number of inconsistencies which makes the identification of its payload difficult. In 2011, a document was published showing NROL-67 launching on Atlas V 541 from Vandenberg Air Force Base with Low Earth Orbit identified as target orbit which is highly unusual because target orbits for NRO launches are normally a closely guarded secret. Also, Atlas V 541 has a LEO Payload Capability of more than 17 metric tons and there is no candidate satellite that would match these criteria. Documents released later showed the launch taking place from Cape Canaveral. It is unclear whether the older document was incorrect or the launch had actually been moved from the West to the East Coast which would suggest that the launch is targeting an orbit that could be reached from both launch sites – such as a highly elliptical Molniya orbit. The NOTAMs provided several days before launch rule out a Molniya Orbit and point to a direct ascent mission to Geosynchronous Orbit. The launch vehicle used for NROL-67, Atlas V flying in the 541 configuration, has not been used on any previous NRO launch. In fact, its only launch prior to NROL-67 was the Mars Science Laboratory mission in 2011. This could suggest that NROL-67 is a new type of satellite or a follow-on to existing NRO satellites using an upgraded platform. Another NRO launch, NROL-42, has been added to the manifest for 2017 also using Atlas V 541 implying that this is not a one-off satellite project and will require more launches in the coming years. The 2017 launch is listed for Vandenberg. It is likely that NROL-67 is an electronic intelligence ELINT spacecraft headed to Geostationary Orbit or Molniya Orbit, the more probable possibility being GEO. Orion ELINT satellites operating in Geostationary Orbit have used heavy-lift launch vehicles (Delta IV Heavy & Titan IV/Centaur) while Trumpet satellites operate from Molniya orbits & have used lighter launchers (Atlas V 411 and Delta IV M+ (4,2)). A likely candidate for this mission is a next-generation GEO ELINT satellite such as an improved Trumpet satellite carrying a modified payload for operation from Geostationary Orbit – a theory published by well-known satellite tracker Ted Molczan in 2012. Another possibility is NROL-67 being a replacement of the Mercury Electronic Intelligence Satellites, the last of which was launched in 1996. The two existing second generation Trumpet satellites were launched in 2006 and 2008 and have a life expectancy on the order of ten years. 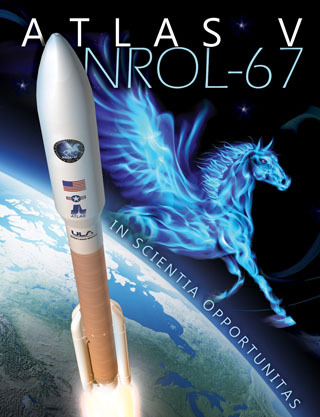 Launching their replacements in 2014 would seem early which indicates that NROL-67 may be a modified Trumpet to operate from Geostationary Orbit that is being launched now to test out its capabilities while the two other satellites ensure a continuous operation of the overall constellation. The change in launch vehicle compared to the previous Improved Trumpets backs this theory up as well. Launched into Molniya orbits on Atlas V 411 and Delta IV M+ (4,2), the two Improved Trumpet satellites are hosting the SBIRS (Space-Based Infrared System) HEO sensors which add to their launch mass totaling about 4,200 Kilograms. 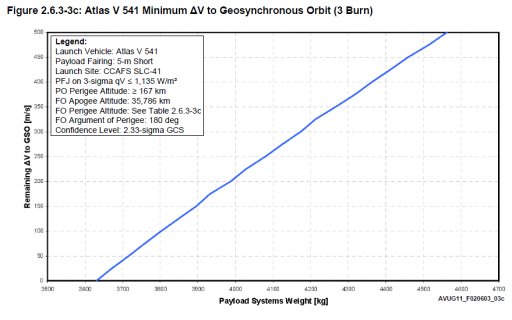 Without the SBIRS Sensor, the Trumpet Platform would fall into the GEO capacity of Atlas V 541 – 3,730kg for an equatorial orbit or ~3,850kg for a slightly inclined Geosynchronous Orbit. Trumpet satellites are signals intelligence spacecraft that feature large deployable mesh antennas to monitor foreign communications and radio transmissions for intelligence and early warning purposes. 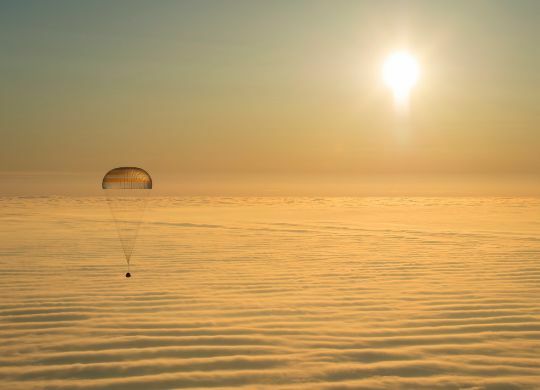 It is believed that the antennas of the satellites span 100 meters when deployed. A 5-metric ton Mercury satellite is just out of the Atlas V’s payload capability to Geosynchronous Orbit, but it is possible that the Mercury follow-on satellites employ mass reductions through the use of current technology and leightweight spacecraft systems which would enable the satellite to make a direct ascent into GEO. A mission to Geostationary Transfer orbit or Molniya orbit requires the Atlas V to perform two burns separated by a short coast while a flight directly to geostationary orbit consists of three burns (LEO insertion, GTO insertion & circularization in GEO) that are separated by a long coast while the vehicle climbs up to apogee. The need of the Extended Mission Kit in order to reach GEO may be the reason behind the 5-meter fairing used on the NROL-67 mission. Hints from the mission patches issued for NRO flights can also help identify the nature of the payload, but after the NROL-39 patch caused a public upset, the National Reconnaissance Office may have reconsidered their philosophy concerning mission patches. 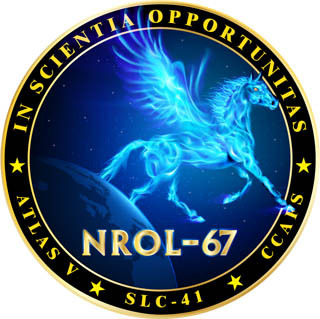 The NRO patch for this flight prominently features Pegasus and the Latin words “In Scientia Opportunitas” (In Knowledge, There is Opportunity). The 5th Space Launch Squadron patch for the launch vehicle shows a Dragon. Pegasus has not been used on any of the recent NRO launches while the Dragon has been a common feature of NRO patches for different types of missions. Final confirmation of the identity of the NROL-67 satellite will be provided by satellite trackers around the world that will be quick to find the new satellite in its orbit shortly after insertion.